Albatron is a name you are probably becoming more familiar with these days. They make some of the best products available in the computer market. Their product line extends from Wifi Audio to SFF barebones and also Plasma screens. The crew at Albatron recently recently released the Mars Px915P4/G4 Pro. After testing this motherboard we think its one of the most impressive we have reviewed. I'm sure your wonder what's so great? How about a dual NIC (1X100 Mb and one Gigabit NIC), RAID on-board for either IDE or SATA or both to cut down on drive access timing... Not to mention the very impressive eight channel on-board sound and the ability to overclock anything and everything. Before we get to far ahead, lets take a few preliminary looks at the board. As you can see its a colorful board which will appeal to the case modders with windows. 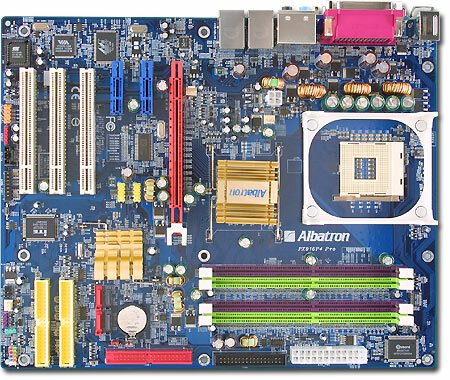 This board also sports a PCI Express x16 slot and twin PCI Express x1 slots. For users who want to use their 478 chips while gaining the ability to use PCI Express x16 video cards this is the perfect transition board.